Editor’s Morning Note: What’s The Opposite Of A Party? It’s Monday, the markets are down, it’s probably raining in London, and no one knows what’s coming next in the worlds of startups and finance. Welcome back to the work week. Leading into the weekend the news was all Twilio, and all Brexit. As the week closed, the popular IPO’s success ran face-first into market turmoil kicked off by the stunning choice of the United Kingdom to leave the European Union. Today we’ll take a quick look at morning market action that will impact sentiment among the constituent cliques of Startupland, and chew on a few short bits that are worth keeping in mind as the month and quarter come to a close. 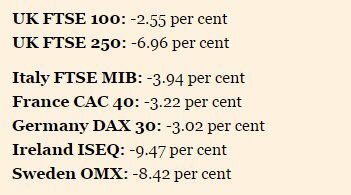 The major American indices are down today, an unsurprising outcome given the sheer amount of global uncertainty generated by the now-planned exit of the UK from the EU. The new global business landscape will impact that country, the European economic region, how multinational companies manage their tax structures, and could change where private investors place bets on quickly growing companies. The Nasdaq, everyone’s simplistic barometer for how the market views technology companies, is off the most of the Big Three today, losing more than two points as of the time of writing. The index fell under the 4,600 threshold in early trading. That was a low-ebb for the year if you discount February’s lull. More simply, tech is taking more fire than other sectors during this period of doubt. That’s unsurprising. However, given that the Nasdaq is not too close to testing year-to-date lows, let alone 52 week lows, things aren’t dire. On a more granular basis, things are bit rougher. Box is off eight points. Square is back under its $9 IPO price. Tesla remains off sharply from its pre-SolarCity offering value, erasing much of the price premium proffered for the smaller company. And, SolarCity is all but back to its own pre-offer levels, indicating either that the market is repricing its value as Tesla’s falls, or that investors are betting that the deal won’t happen. Or both. Among the platform players, Microsoft is back under $50, Google is trading at year-to-date lows, and Apple is off 31 percent from its 52 week high. We are seeing a modest repricing of the value of public tech companies, at least in the short term. If this keeps up for a few more days, it’s going to start to hurt at an increasing pace. Takehome for startup kids: Don’t panic if you are in good financial shape, but if you are looking to raise capital soon, you might want to start about two months ago. That is just a small sample. If you need more content, it’s out there. Closing the topic, John Biggs has a call to arms over for Europe on TechCrunch that is worth reading. Despite the current chop, Intel might sell its security business. According to The Financial Times, the potential deal could tip the scales at or greater than the $7.7 billion that Intel previously paid for the assets in question. If the sals happens, it will be a multi-billion dollar boost to the year’s aggregate M&A tally. However, as the deal will likely be a public company selling a chunk of its business to a private equity consortium, it won’t move the needle in terms of exits for private, venture-backed companies. By now you have heard of esports. Competitive gaming has become an international business, with prize pools occasionally stretching into the seven-figure range. To date, the industry has mostly focused on console and PC-based games. Now, mobile games are fighting to claim their own slice of the lucre. Top Gif From #WhenInFinance, Via Busines Insider.